Since 1988, oceanographers have been studying a patch of deep blue 60 miles north of Oahu known as Station ALOHA. But despite extensive work there, much remains unknown about the diversity of the area’s zooplankton. On the third Schmidt Ocean Institute student cruise, from June 13th to June 19th, team members will gather new information about these lesser known animals, while working to develop new techniques for studying them. The research will serve as a foundation for multiple Ph.D. dissertations and provide both graduate and undergraduate students involved indispensable ocean-going experience. Much of the research at Station ALOHA, which stands for A Long-term Oligotrophic Habitat Assessment, will focus on the small crustaceans known as copepods that are ubiquitous in ocean waters—so ubiquitous in fact that identifying them all and tracking changes in their populations remains challenging. Two student projects will rely on samples collected using the water capture bottles on Falkor’s CTD rosette. One, led by Michelle Jungbluth, will involve experiments to look at grazing of copepod larvae, or nauplii. Such grazing, which team members will quantify during incubation experiments, is a critical component in ocean nutrient cycling. Another project will take an exploratory view of fluorescence in copepods. Many animals have proteins that fluoresce, which means that these proteins absorb light of one color and reemit it as a different color. This is the same phenomenon that crime scene investigators take advantage of to spot blood. Kate Hanson will lead a study of live copepod samples to begin establishing which open ocean species have fluorescent proteins, and whether these proteins provide advantages, for instance aiding mating or offering UV protection. 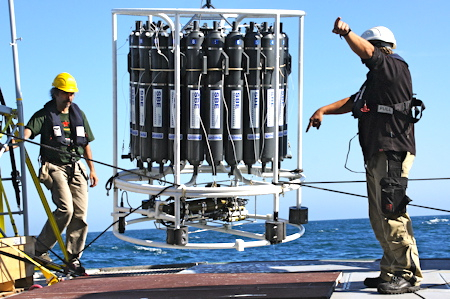 Twice each day at ALOHA, centered at noon and midnight, the team will also deploy a MOCNESS (Multiple Opening and Closing Net with Environmental Sensing System). This is a roughly 2-meter by 3-meter metal frame with 10 mounted plankton nets and sensors that track the depth and position of the nets as well as ocean conditions in real-time. At the behest of computer signals, bars drop down the frame to open and close separate nets so that each collects samples only at a desired depth. 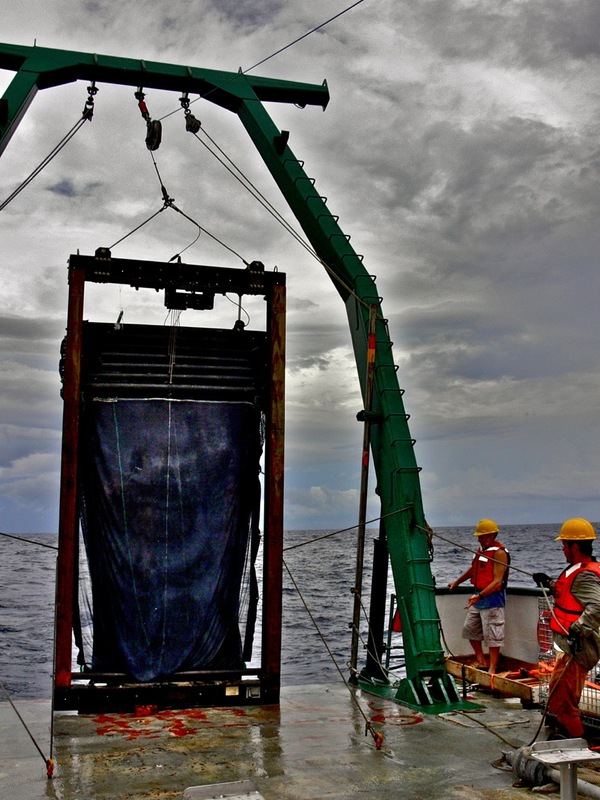 Such depth separation is critical to understanding where different animals are typically found, as normal nets collect samples at all depths as they are pulled up. Traditionally, researchers have relied on tedious microscope analyses of collected samples to answer questions about what species are found at a given location and how abundant they are. But this process is not only time consuming, it’s also difficult, and a shrinking number of people in the world have the expertise to make the identifications. Today, many groups have to send their samples to other insitutions around the world for identification. As you might imagine, this has severely limited understanding of copepod and other zooplankton communities. Chief scientist Erica Goetze hopes, with help from the student team, to advance work to develop an easier, more rapid way of analyzing zooplankton samples. Specifically, they’ll be applying DNA sequencing techniques, which have grown increasingly rapid and sophisticated in recent years, to identify the species and their numbers from samples collected with the MOCNESS between the surface and 1,500 meters (the twilight zone). 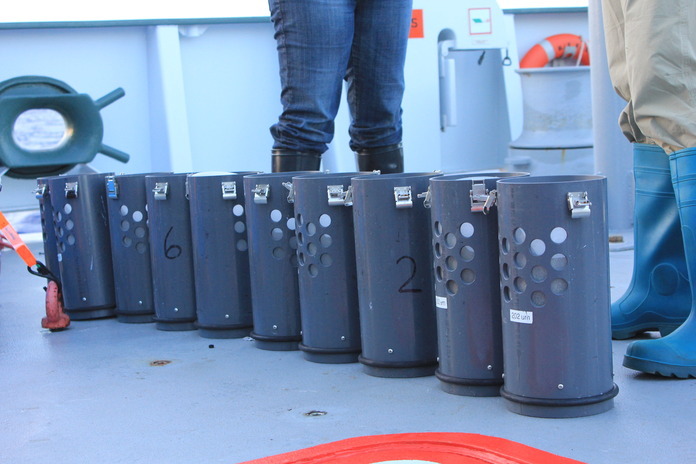 The process involves sieving collected sample material to separate different plankton sizes, then grinding up this material for DNA sequencing. The team will be looking at particular genes established through previous research as good ‘barcoding’ markers to identify species, and comparing these sequences against existing databases developed as part of the Census of Marine Life. These comparisons will give insight into the proportion of zooplankton communities that are currently undescribed species. 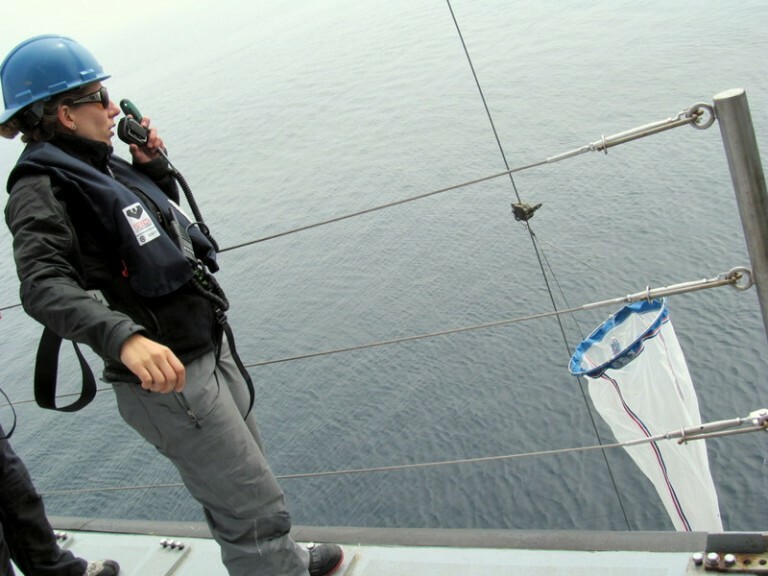 Goetze hopes that work aboard Falkor will provide a good training opportunity for students while also leading to refinement of this genetic technique that could greatly expand understanding of zooplankton populations around the world and how they change over time, for instance in response to climate change. 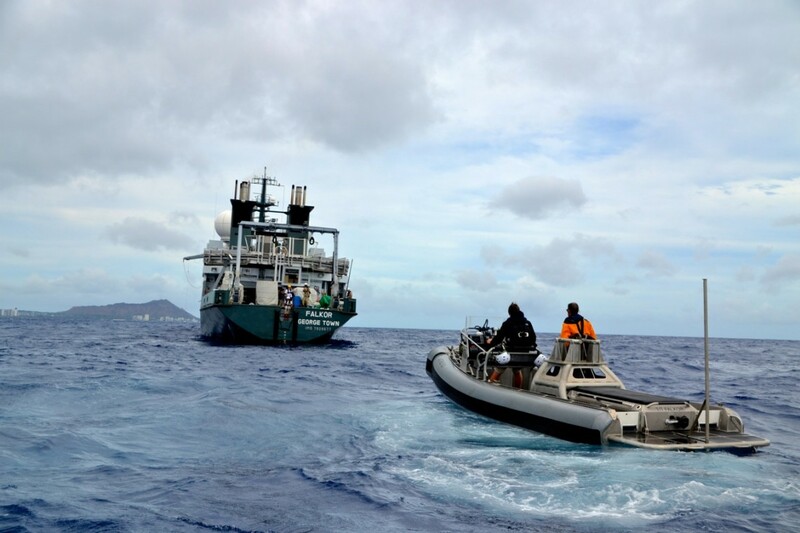 A final day of the cruise will be spent using Falkor’s sonar system to map the seafloor at the Kiawe Channel between the islands of Oahu and Molokai. Melissa Patrician, a researcher aboard the R/V Falkor's first shakedown cruise directs a plankton net tow on July 17, 2012. A MOCNESS frame after a deployment. Note the cross bars at the top that separate the individual nets. Falkor and the small boat Atreyu off the coast of Oahu. Metabarcoding zooplankton data is available at BCO-DMO.